Posted by americanex in About kids in USA, Uncategorized. A pen pal is someone who lives far away, some times in another country, that you write to regularly. It may be someone you already know, or it can be someone you do not know but would like to learn about. You can also learn about the country they live in and how things are different or the same as where you live. When I was a little girl, I had a pen pal that I wrote to with a pen on paper. Today, I write to my pen pals through email. The children from Fairport Elementary have learned a lot about Ukraine through my letters. I told them about the English Clubs at our Library and about the students I visit at many of the schools in Kherson. It was nice to get to meet the children from Fairport in person. They had so many questions about the children in Ukraine and what schools are like here. They also wanted to know about the children that visit the Kherson Oblast Children’s Library and what life is like in Kherson. 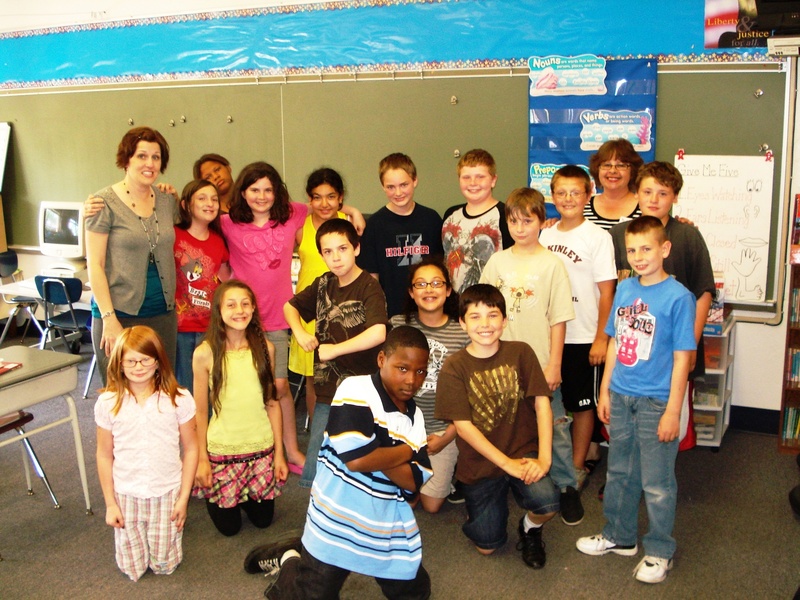 Below is a picture of the kids in their classroom with their teacher, Sabrina Rowan. Mrs. Rowan’s class was anxious for summer vacation. Many of them told me they would like to have a pen pal from Ukraine. If you would like to have a pen pal from America, come and visit me in the Foreign Literature Department at the Children’s Library. I will help you get started finding a friend from far away and you can learn more about life in America. What do these three words have in common? They all refer to thinking about something from the past. Here in Ukraine, there are special days where we can remember the past…that would include t celebrating Victory Day on May 9th. It would also include remembering our hard work by celebrating Labor Day on May 1st. And on May 24th, we think about God on Trinity Sunday. In America, we have a day of remembering too – May 31st, Memorial Day. Memorial Day is when Americans remember those soldiers (they are also called veterans) that died in a war. We also think about and cherish the memories we have with our family members that served in a war and have passed away. My father, John Molnar, served in World War II. He was a Sargent in the Medical Air Evacuation Unit of the United States Air Force. His job was to take care of the wounded soldiers while they were in the airplanes that flew them from the front lines of battle to hospitals in the safe zones. My father did not die in World Ware II. He lived to be 84, raised 5 daughters and enjoyed life to the fullest. He loved to travel, and as a family, we traveled by car all over the United States. After the war, my father worked as a nursing assistant at a hospital in Cleveland, Ohio. The work was very difficult and tiring. After several years, he went to work in a factory that made medical products. He worked on big, loud machinery and eventually lost some of his hearing because of it. Eventually, my father returned to his roots and worked in a hospital again. He was an orderly at a hospital in Painesville, Ohio. He retired from that job, and I remember visiting the hospital where he worked him. All the nurses knew him by name and told me how they loved working with my father because he was such a kind man and hard worker. I was very proud of my father for that, and for many other reasons. 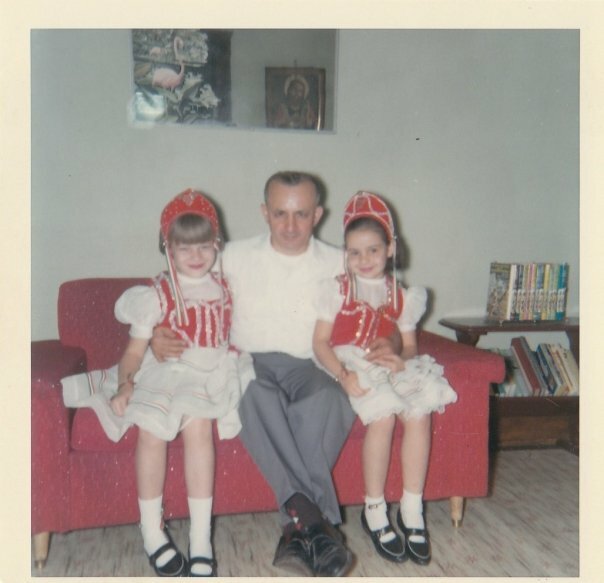 This is a picture of my sister, Barbara, my father and me. My sister and I are all dressed up to dance at the Hungarian Festival at our church in Cleveland, Ohio.